The guys at Epic say that the Screamer LTD V3 is like the Screamer, but on steroids. And they are right. It’s not the size that makes the Screamer LTD so powerful and quick, but the tweaks the design team has used in the development process. The 10 meters Screamer LTD provides you with awesome thrust, more speed, more lift and more of everything you need for an explosive session. This is perfect kite for big boost enthusiasts. The Epic Screamer 4G V3 LTD takes the power and torque of the standard Screamer to a new level. 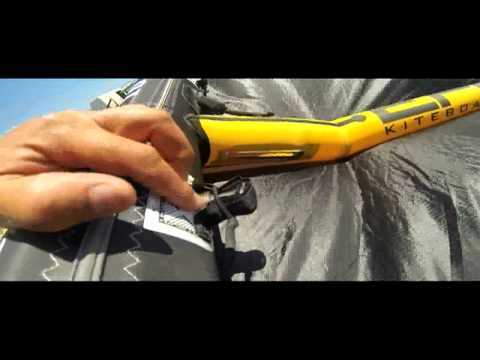 This 10m kite is faster, more powerful and more suitable for expert and aggressive riders. The canopy is shaped to turn raw wind power into pure energy. However, the power delivery is not abrupt, but rather consistent and predictable. Both low end and high end abilities have been improved. The power is smoother on the upper end and more consistent on the low end. The swept wingtips assure fast turning and allow the kite maintain power when performing a turn. This feature helps when performing powered kiteloops. A five strut configuration assures superior stability and keeps the kite crisp in the air, eliminating flutter issues. The Screamer LTD sports a different profile than the standard Screamer. It features a more distinct C shape which makes in more powerful and faster. The leading edge is optimized to pierce through wind lulls and boost the kite’s upwind ability. The Screamer LTD is able to boost huge airs and provide massive hangtime. It is also very easy to relaunch and offers nearly total depower when needed. huge boost power! only for who can handle it!